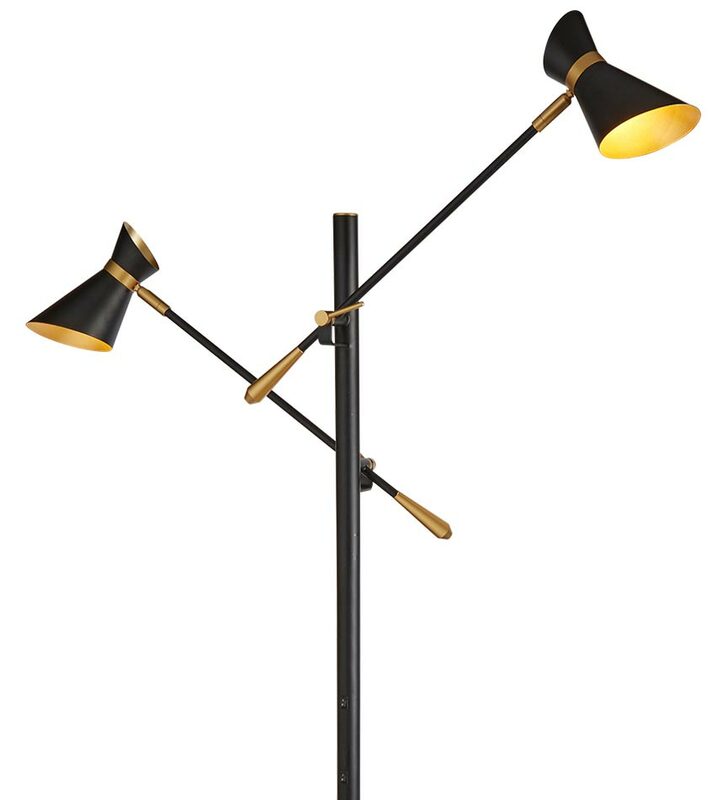 This Diablo 2 light LED spot light floor lamp in matt black and gold finish is contemporary stylish and practical. Featuring a circular base and tall stem in matt black and two fully adjustable LED spotlight heads mounted on adjustable swivel arms. The arms swivel and can be locked in place and the the heads feature tilt adjustment for maximum flexibility. Fitted with two rocker switches on the stem for flexibility and convenience. Perfect for adding contemporary appeal to dining rooms and living rooms and practical too. Make a statement with this matt black and gold floor light. The simple matt black stem and two lights have fully directional arms. A complementary gold trim has been added to each arm and also to the inner shade. The gold trim on the fitting and inside of the shades contrasts beautifully against the black body. There are matching products available in the black and gold finish Diablo spotlight range that includes a switched wall light, two, three, four and six light ceiling spots and a table lamp; please see below. Also available in black and white finish with chrome highlights, please enter the term Diablo in the search box at the top of this page to discover the complete range. This floor light is supplied by Searchlight who manufacture some of the best traditional and modern classic designs such as the Diablo 2 light LED spot light floor lamp in matt black and gold you see here.